To squash means ‘to crush or press into a flat mass’ and also ‘to cram or press into a small space.’ Figuratively, it means ‘to silence or suppress.’ As a noun, squash is of course the instance and act of squashing, but it is also a sport for two or four people played with rackets. 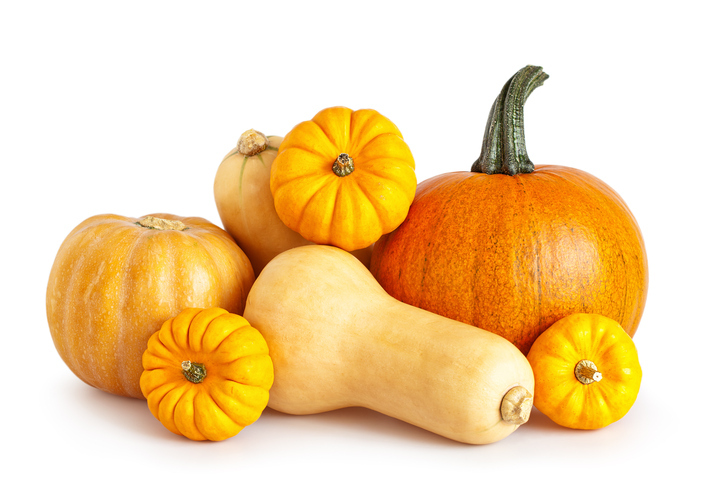 Unrelatedly, a squash is a type of vegetable, actually the fruit of a plant of the gourd family, eaten as a vegetable. Don't put that heavy can on top of the tomatoes in the shopping bag; you'll squash them! Lisa squashed her clothes into the suitcase. Ned squashed his feelings and tried to appear happy. Getting the bags into the car was a squash, but we managed to fit everything in. Marion plays squash every Wednesday. We're growing four varieties of squash in our garden. In UK English, squash is also a type of cordial (a sweet, concentrated, fruit-based drink) that is diluted with water and drunk. As vegetables, squashes fall into two categories. Summer squashes include zucchini (in US and Australian English—in the UK, we call these courgettes), pattypans, globe squashes, and crookneck squashes and usually grow on large bush plants. Winter squashes mainly grow on vining plants and include butternut, acorn, and spaghetti squashes, and pumpkins. Squashes can be used in all sorts of dishes, like this chilli recipe (as usual, tried and tested by a member of the Word of the Day team). Squash dates back to the early 14th century. The verb, in the form of the Middle English squachen, meant ‘to crush or squeeze,’ and came into English from the Middle French esquasser (to break, crush, shatter or destroy). It can be traced back to the Vulgar Latin exquassare, from the Latin prefix ex (out) and verb quassare (to shatter), itself a frequentative of quatere (to shake) and further back to the Proto-Indo-European root kwet– (to shake). It is related to the Greek passein (to sprinkle), the Lithuanian kutėti (to shake up), the Old Saxon skuddian (to move violently), the German schütteln (to shake) the Old English scudan (to hasten) and the Spanish sacudir (to shake), as well as the English words quash, percussion, discussion and rescue. The noun, meaning ‘the act of squashing,’ comes from the verb, and dates back to the early 17th century. The sport has been called squash since the late 19th century; before then (but only by a decade or so), squash was the name of the ball used to play the sport. Finally, squash meaning ‘a type of vegetable’ dates back to the mid-17th century. The word came into English from the Narragansett, an indigenous American language spoken in the north east (what would now be the state of Rhode Island). It is a shortening of the word askutasquash, which meant ‘a vegetable eaten green or raw,’ from askut (green or raw) and asquash (eaten).